The S.C. Department of Natural Resources has issued a burning ban on the 33,000-acre Jocassee Gorges area in northern Pickens and Oconee counties due to extremely dry conditions. The 10-mile section of the Foothills Trail between Table Rock State Park and Sassafras Mountain has been closed as 30 or more firefighters battle a "significant" wildfire burning in northern Pickens County, mostly on State Park lands. The S.C. Forestry Commission is in charge of the fire, assisted by the S.C. Department of Natural Resources (SCDNR). The command post for the fire has been set up at Holly Springs Baptist Church, on US 178 near the intersection with SC 11. The 10-mile section of the Foothills Trail between Table Rock State Park and Sassafras Mountain, at 3,583 the highest point in South Carolina, has been closed because the wildfire makes it unsafe for hikers. The Foothills Trail is a 77-mile mountain footpath between Table Rock State Park in Pickens County and Oconee State Park in Oconee County. 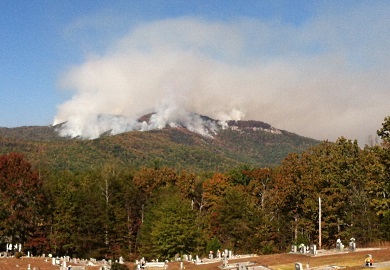 Some 30 firefighters from the S.C. Forestry Commission, SCDNR, area volunteer fire departments and the Pickens County Strike Team were battling the wildfire Thursday on Pinnacle Mountain near Table Rock State Park in northern Pickens County. The fire was started accidentally by a campfire near the Foothills Trail on Nov. 9. The S.C. National Guard helicopter was assisting firefighters, as was Pickens County Emergency Management. Tom Swayngham, SCDNR assistant chief of wildlife, called the effort to control the wildfire "a major operation" that involved "significant" acreage. Burning, including campfires, will not be allowed on any Jocassee Gorges lands until further notice. The S.C. Forestry Commission has issued a State Forester's Burning Ban, effective immediately, for five Upstate counties: Anderson, Greenville, Oconee, Pickens and Spartanburg. State Forester Gene Kodama enacted the ban Nov. 9 because of weather conditions in the Upstate that present an elevated risk of wildfire. Forecasts for the aforementioned five counties over the next week include gusting winds and very low relative humidity, which combine with dry fuels on the ground to create the potential for outdoor fires escaping easily and spreading rapidly.